(Left to Right) Bill Brosius, vice president and chief financial officer of Baylor St. Luke’s Medical Center; Jim Burns, leader of individual investor business globally at Kohlberg Kravis Roberts & Co. (KKR), and Cindy M. Sanborn, executive vice president and chief operations officer for CSX Transportation. 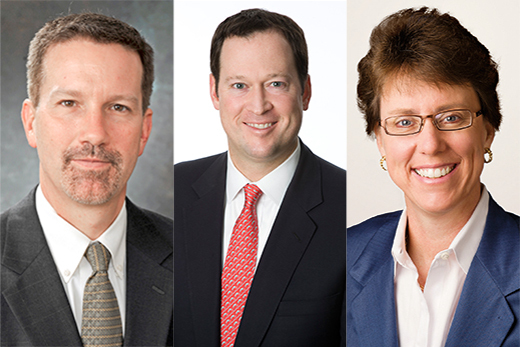 Bill Brosius, vice president and chief financial officer of Baylor St. Luke’s Medical Center; Jim Burns, leader of individual investor business globally at Kohlberg Kravis Roberts & Co. (KKR), and Cindy M. Sanborn, executive vice president and chief operations officer for CSX Transportation. Brosius has 30 years of experience in the financial operations of healthcare organizations. In his current role with CHI-Baylor St. Luke's, he is responsible for the overall financial operations of the 861-bed facility, located in Houston, Texas. His administrative responsibilities also include case management, patient access services, physical medicine & rehabilitation, social work services and service line business planning. He works closely with the chairman of the hospital’s finance and audit committee and the finance team at St. Luke’s Health System’s corporate office. Brosius also serves as liaison to both the Texas Heart Institute and to Supply Chain Management. Prior to Baylor St. Luke’s, Brosius served as senior financial consultant with The Lane Group, Inc., a boutique healthcare consulting firm. Upon graduating from Emory’s Goizueta Business School in 1985, Brosius began his career with Arthur Andersen & Co. in Atlanta. Burns joined private equity firm KKR in 2010 and is a member of the Client and Partner Group, where he leads KKR’s individual investor business. Prior to joining KKR, Burns was a managing director in the Private Wealth Management Division of Morgan Stanley, where he worked for nearly 13 years and held a variety of positions, most recently as head of the Eastern United States for Private Wealth Management. Burns holds a bachelor's degree from Emory, where he was Phi Beta Kappa and an NCAA All-American tennis player. He holds an MBA from Harvard Business School. Burns serves as a member of the Emory College Alumni Board. He is a member of the board of trustees for the Convent of the Sacred Heart in New York and for the Harvard Business School Club of New York. Sanborn is responsible for all aspects of service delivery at CSX Transportation, the main subsidiary of CSX Corporation. She directs the operation of more than 1,200 trains daily, the maintenance of approximately 4,000 locomotives and 67,000 rail cars, and the maintenance and upgrades of the company's more than 21,00-route-mile network in the Eastern United States and two Canadian provinces. Sanborn, who joined CSX in 1987, was named executive vice president-operations in February 2015, and added the chief operating officer role in September 2015. Previously, she was vice president and chief transportation officer. She earned a bachelor's degree from Emory and a master's degree in business administration from the University of Miami. She currently serves on the board of directors of Conrail and the Transportation Technology Center, and has been recognized for her contributions to diversity recruiting and employee development. The 45-member Board of Trustees oversees the governance and long-range fiduciary health of the university. Term trustee nominees are selected by the board's Governance, Trusteeship and Nominations committee; alumni trustee nominations are recommended by the Emory Alumni Board. Both are submitted to the Board of Trustees for consideration and approval. Final approval rests with the Southeastern Jurisdictional Conference of The United Methodist Church. Brosius, Burns and Sanborn are alumni trustees, elected to serve a six-year term.